7/8/2014 - Flying Blood Bairn. Or smaller & squarer Fallen Angel, for the old-timers. Creatures have come a long way. Did you deliberately make this common, or just not think about the rarity? For me this is a bit too impacting to be common. Devouring Swarm was a fine common, and I'd imagine this guy, while very good would be too. Devouring Swarm gave +1/+1 at common. I feel this would need to do the same or bump up to uncommon. Though I suppose it also depends on the limited environment. Keeper of Night would definitely be a strong common, but I don't think it's too good for a set that doesn't make a lot of tokens. Might want to be 2BB, though. I'd far rather print this at uncommon in a set that has support than deliberately underprint support to put it at common. I think the usual solution to this would be to make it less efficient by pushing it up to like a 4BB 3/3 Flier, but Black doesn't (typically) get fliers of that size at common. There seems to be good precedent for 3/2 common fliers in Black. Also, as a note, I don't think this is too strong to be common, I think it is too swingy to be common. This card just wins the game out of no where very easily. When was the last common that could easily do 8 damage the turn after you cast it? That said, I don't think this card is a particularly high pick or anything. 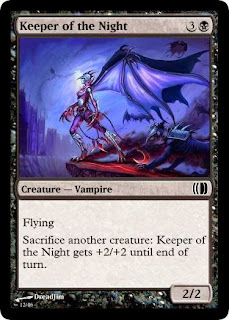 It is great for it to exist, but I'd hate for "Keeper of the Night, GG" to be a defining moment of any format. 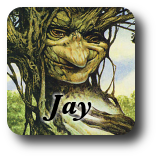 I'd be happy to see this at uncommon in a set with lots of tokens. ~ can't block and is unblockable. Sacrifice another creature: ~ gets +1/+1 until the end of the turn.